Mirror, Mirror, on the Wall, Which Nation Has Increased Welfare Spending the Fastest of All? That’s reasonably amusing, but it also provides some insight into national competitiveness. In the battle for jobs and investments, nations can change policy to impact their attractiveness, but they also can gain ground or lose ground because of what happens in other nations. The corporate tax rate in the United States hasn’t been changed in decades, for instance, but the United States has fallen further and further behind the rest of the world because other nations have lowered their rates. Courtesy of a report in the UK-based Telegraph, here’s another example of how relative policy changes can impact growth and competitiveness. The paper looks at changes in the burden of welfare spending over the past 14 years. The story understandably focuses on how the United Kingdom is faring compared to other European nations. Welfare spending in Britain has increased faster than almost any other country in Europe since 2000, new figures show. The cost of unemployment benefits, housing support and pensions as share of the economy has increased by more than a quarter over the past thirteen years – growing at a faster rate than in most of the developed world. Spending has gone up from 18.6 per cent of GDP to 23.7 per cent of GDP – an increase of 27 per cent, according to figures from the OECD, the club of most developed nations. By contrast, the average increase in welfare spending in the OECD was 16 per cent. This map from the story shows how welfare spending has changed in various nations, with darker colors indicating a bigger expansion in the welfare state. American readers, however, may be more interested in this excerpt. In the developed world, only the United States and the stricken eurozone states of Ireland, Portugal and Spain – which are blighted by high unemployment – have increased spending quicker than Britain. Yes, you read correctly. The United States expanded the welfare state faster than almost every European nation. Here’s another map, but I’ve included North America and pulled out the figures for the countries that suffered the biggest increases in welfare spending. 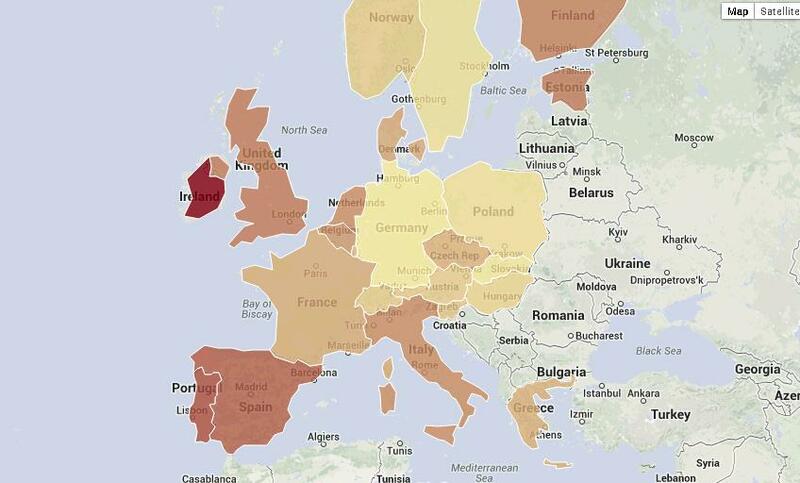 As you can see, only Ireland and Portugal were more profligate than the United States. Needless to say, this is not a good sign for the United States. But the situation is not hopeless. The aforementioned numbers simply tell us the rate of change in welfare spending. But that doesn’t tell us whether countries have big welfare states or small welfare states. That’s why I also pulled out the numbers showing the current burden of welfare spending – measured as a share of economic output – for countries in North America and Western Europe. This data is more favorable to the United States. As you can see, America still has one of the lowest overall levels of welfare spending among developed nations. Ireland also is in a decent position, so the real lesson of the data is that the United States and Ireland must have been in relatively strong shape back in 2000, but the trend over the past 14 years has been very bad. It’s also no surprise that France is the most profligate of all developed countries. Let’s close by seeing if any nations have been good performers. The Telegraph does note that Germany has done a good job of restraining spending. The story even gives a version of Mitchell’s Golden Rule by noting that good policy happens when spending grows slower than private output. Over the thirteen years from 2000, Germany has cut welfare spending as a share of GDP by 1.5 per cent… Such reductions are possible by increasing welfare bills at a lower rate than growth in the economy. But the more important question is whether there are nations that get good scores in both categories. In other words, have they controlled spending since 2000 while also having a comparatively low burden of welfare outlays? 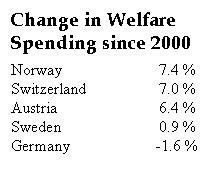 Here are the five nations with the smallest increases in welfare spending since 2000. You can see that Germany had the best relative performance, but you’ll notice from the previous table that Germany is not on the list of five nations with the smallest overall welfare burdens. Indeed, German welfare spending consumes 26.2 percent of GDP, so Germany still has a long way to go. The nation that does show up on both lists for frugality is Switzerland. Spending has grown relatively slowly since 2000 and the Swiss also have the third-lowest overall burdens of welfare spending. Hmmm…makes you wonder if this is another sign that Switzerland’s “debt brake” spending cap is a policy to emulate. By the way, Canada deserves honorable mention. It has the second-lowest overall burden of welfare spending, and it had the sixth-best performance in controlling spending since 2000. Welfare outlays in our northern neighbor grew by 10 percent since 2000, barely one-fourth as fast as the American increase during the reckless Bush-Obama years. No wonder Canada is now much higher than the United States in measures of economic freedom. You are very very wrong about Canada. Canada is extremely socialist ..when you chart public spending as percent of gdp you forgot this is only the output. The input is the super high Canadian tax rates. What it means is they collect alot but it doesn’t show up in public spending. Canada is therefore the worst of all worlds, low spending and high taxes means you pay alot and get very little back for it ! What a sad legacy Obama is leaving!!! This is why welfare benefits are a method to kick start the economy into a virtuous cycle. The welfare benefits are handed out, but then are taxed, and the tax revenue can, in turn, finance new benefits. A virtuous cycle to prosperity thus begins. Measures of welfare spending are deceptive. In continental Europe, welfare benefits are taxed; in Denmark, they are taxed at Danish rates! In the UK and US, welfare benefits are untaxed. As a result, both welfare spending and tax revenues look smaller in the UK and the US, than they really are. Or, if you prefer, both welfare spending and tax revenues look bigger in continental Europe than they really are.